Unique programs are conducted, which explore and celebrate the lives of great beings from the past, its format offering deep dimensions of inner growth along with threads of color and culture woven through it. Mahabharat the greatest story ever told! It is a representation of the multiple expressions of human consciousness, from the lowest to the highest, encompassing every shade of humanity that exists in between. 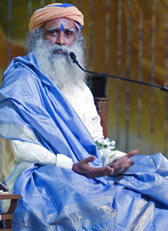 Sadhguru conducted Mahabharat – Saga Nonpareil, a week-long extravaganza in February 2012. This unique program was an intimate and powerful spiritual process, and an opportunity to explore one’s own consciousness while Sadhguru personally took participants through the lives and stories of the varied characters.